And, oh yes, slate roofs are heavy—and expensive—putting them out of the reach of most property owners….until now. 1) Attic VentilationTruSlate® Ridge Vent helps remove excess heat and moisture from your attic that can raise your energy bills, cause premature peeling of interior paint and wallpaper, and even affect your health. 2) TruSlate® Trim SlateTruSlate® trim slate is designed specifically for the hip and ridge areas of your TruSlate® roof. It provides added protection to these vulnerable areas and is a perfect complement to the color of your roof. 3) UV & Moisture BarrierUnderBlock® UV & Moisture Barrier provides an extra layer of protection for your roof. It’s made from ultra-tough high density polyethylene—the same material that’s used in demanding environmental applications. 4) Roof Accessory PaintShingleMatch® Premium Roof Accessory Paint is a great option to help you “hide” unsightly roof accessories by making them blend in with the color of your slates… for a better-looking finished roof. 5) TruGrip™ Battens & HangersPatented TruGrip® Battens and Hangers are designed to lock each slate tightly in place to help prevent blow-offs. Made from high quality stainless steel to last the life of your roof. 6) Lay -Straight® Alignment TapeLay-Straight® Alignment Tape will help to keep your courses straight, for a better-looking finished roof. 7) Leak BarrierWeather Watch® and StormGuard® Leak Barriers provide exceptional protection against leaks caused by roof settling and extreme weather. Ideal upgrade at all vulnerable areas. 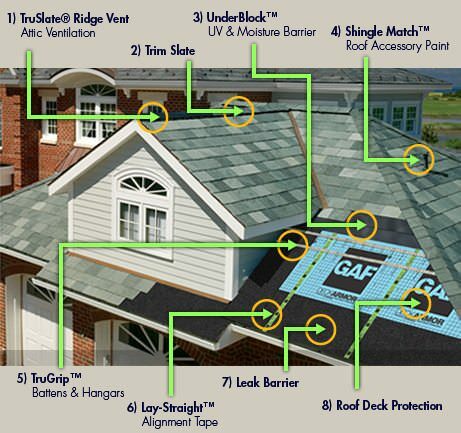 8) Roof Deck Protection“Breathable” Deck-Armor™ allows moisture to escape from your attic while providing an exceptionally strong layer of protection against wind-driven rain. It also lays flatter for a better-looking roof. The TruSlate® Americana Slate Collection features five traditional colors from America’s most famous New England quarries, which are known worldwide for their proven products and excellent quality control. These domestically quarried slates have been installed for over a century on the finest properties across North America. And now, by incorporating them into the TruSlate® System, we’ve made them an affordable option for just about everyone. Proven Quality: These slates are classified Grade S1— the highest slate-quality grade in the industry — thanks to their long track record of both beauty and performance.